Rasmussen finds 57% of U.S. voters favor a military response to eliminate North Korea’s missile launching capability. Just 15% of voters oppose a military response and 28% are not sure. Support for a military response comes from 66% of Republicans, 52% of Democrats and 54% of those not affiliated with either major political party. There is no gender gap on the issue as a military response is favored by 57% of men and 57% of women. Seventy-three percent (73%) are at least somewhat concerned that North Korea will use nuclear weapons against the United States. The survey was conducted April 3-4, the two days immediately prior to North Korea’s launch. The question asked about a military response if North Korea actually did launch a long-range missile. Will President Obama's tough talk and U.N. approach to the North Korean rocket launch satisfy this majority of voters? The president said North Korea's action threatens the security of nations "near and far." Obama also called North Korea's rocket launch a clear violation of United Nations Security Council Resolution 1718, which prohibits North Korea from conducting ballistic missile-related activities of any kind. The Security Council adopted the 2006 resolution five days after North Korea conducted a test of a nuclear weapon. The U.N. Security Council is meeting in an emergency session on Sunday to deal with the matter. Don't count on any useful action coming out of the Security Council. The 15 members are divided over the possible measures for North Korea's "clear breach of U.N. Security Council Resolution 1718." The United States and Japan might call for a new resolution consisting of tougher measures, or push to actually enforce the existing resolutions. But China and Russia will continue to protect North Korea from any meaningful sanctions. After North Korea's missile and nuclear tests in 2006 the U.N. Security Council adopted Resolution 1718 prohibiting North Korea from conducting nuclear tests or launching ballistic missiles. You can the "U.N. Security Council Resolution 1718 (2006)," below. The United Nations Security Council adopted a third resolution imposing sanctions on for its refusal to cease enriching uranium designed to build nuclear weapons. The new sanctions add to Council sanctions imposed in 2006 and 2007. The resolution was adopted by a vote of 14 - 0, with Indonesia abstaining, and calls on "Member States" to inspect cargoes to and from believed to contain goods prohibited by U.N. resolutions, mandates tighter monitoring of financial institutions and imposes additional travel bans and asset freezes. Instead of suspending its proliferation-sensitive activities as the council has required, is dramatically expanding the number of operating centrifuges and developing a new generation of centrifuges, testing one of them with nuclear fuel. The latest report from the IAEA [the International Atomic Energy Agency] states that has not met its obligation to fully disclose its past nuclear-weapons program. On the core issue of whether 's nuclear program is strictly peaceful, the report showed no serious progress. The IAEA presented with documents assembled over a period of years from multiple member states and the agency's own investigations. The documents detailed 's efforts to develop a nuclear warhead, including designs for a missile re-entry vehicle, and showed other possible undeclared activities with nuclear material. dismissed these documents as "baseless and fabricated." But the IAEA does not share that conclusion. Instead of slogans and obfuscations, the international community needs answers from . The international community must be able to believe 's declaration that its nuclear program is for exclusively peaceful purposes. ian leaders must as a first step fully disclose past weapons-related work, and implement additional safeguards to ensure no continuing hidden activities. We agree with the IAEA that until takes these steps, 's nuclear program cannot be verified as peaceful. The latest IAEA report also states that is not suspending its proliferation-sensitive activities. For almost two years now, the Security Council has required to suspend all of its enrichment-related, reprocessing, and heavy water-related activities. I want to ask the ian leaders, "If your goal is to generate nuclear power for peaceful purposes, why do you court increasing international isolation, economic pressure and more, all for a purported goal more easily and inexpensively obtained with the diplomatic solution we and others offer?" I want the ian people and others around the world to know that the United States recognizes 's right to develop nuclear energy for peaceful purposes. They should know that the five permanent members of the Security Council and Germany have offered to help develop civil nuclear power, if it complies with the Security Council's demand -- a very reasonable demand -- to suspend enrichment. They should know that the package of incentives includes active international support to build state-of-the art light water power reactors, and reliable access to nuclear fuel. should do what other nations have done to eliminate any doubts that their nuclear program is peaceful. Many states have made the decision to abandon programs to produce a nuclear weapon. Two of them sit on the Security Council today: South Africa and Libya. Other countries that have stepped away from past nuclear-weapon aspirations include Brazil, Argentina, Romania, Ukraine and Kazakhstan. These countries did not see their security diminished as a result of their decisions. Indeed, one could easily say their security has been enhanced. Nor did they lose their right to develop nuclear energy. We urge to take the same path these other states have chosen. The international community has good reason to be concerned about 's activities to acquire a nuclear-weapons capability. The present ian regime, armed with nuclear weapons, would pose a greater potential danger to the region and to the world. The ian government has been a destabilizing force in the broader Middle East and beyond. Contrary to its statements, has been funding and supporting terrorists and militants for operations in Lebanon, the Palestinian territories, Iraq and Afghanistan. Their lethal assistance has harmed countless innocent civilians. The president of has made many reprehensible statements -- embracing the objective of destroying a member state of the United Nations. Because of all these factors, the international community cannot allow to develop nuclear weapons. If continues down its current path, it would likely fuel proliferation activities in the region, which, in turn, could cause the demise of the Nuclear Non-Proliferation Treaty regime itself. The U.S. remains committed to a diplomatic solution. If shares this commitment, it will suspend its enrichment and reprocessing activities and let diplomacy succeed. The documents Ambassador Khalizad referred to discredit the December 2007 National Intelligence Unintelligence Estimate (NIE), which Ahmadinejad called a "declaration of victory." Not only did McConnell testify that the Islamic Republic was working to master the enrichment of uranium--"the most difficult challenge in nuclear production"--but he also acknowledged that, "because of intelligence gaps," the U.S. government could not be certain that the ian government had fully suspended its covert nuclear programs. "We assess with high confidence that has the scientific, technical, and industrial capacity eventually to produce nuclear weapons," he testified. "In our judgment, only an ian political decision to abandon a nuclear weapons objective would plausibly keep from eventually producing nuclear weapons--and such a decision is inherently reversible." WALLACE: Finally, you have dialed back on the recent national intelligence estimate that reported that gave up its nuclear weapons program in 2003. In fact, you said you wish you had the opportunity to redo the public presentation. Do you feel that the NIE understated the threat from ? MCCONNELL: No. Chris, if the words in the NIE were correct, what I think we probably didn't do an adequate job on is reflecting — there are three parts to a nuclear program. You have to have fissile material. You have to have a means to deliver a weapon. And you have to have the technical — to design a weapon. The only thing that they terminated in 2003 was the design feature of the weapon. They're still pursuing fissile material. They're still pursuing missiles for delivery. As it turns out, though, the hardest part is fissile material. The easiest part is weapons design. So when I testified on the Hill recently, the attempt was to put it in context. WALLACE: So are you saying that and its uranium enrichment program and what that could lead to is as much of a threat as it ever was? MCCONNELL: I am saying that. And I believe that the path they were on to achieve nuclear weapons has not been significantly changed because they terminated this technical design feature. They can turn it on. Remember, it was secret. They've never admitted it. They could have turned it back on now and we wouldn't necessarily know. We'll try to know, but we're not 100 percent sure of that. WALLACE: And the time frame for them to get the ability to make a nuclear bomb? MCCONNELL: We've done an estimate in 2001, 2005 and 2007, and each time it says the same thing. They could do it by 2009 — unlikely. The range is 2010 to 2015. And the best guess is about the middle range there for having a nuclear weapon. Israel's Prime Minister Ehud Olmert believes that could have "a nuclear weapons capacity" in a few months. Continuing to dither on, Britain, France and Germany were said to preparing a draft resolution critical of that could be adopted by the IAEA's policy-making body later this week. According to the New York Times, the United States, Canada, Australia and Japan already have indicated privately they would support such a move, but Russia and China have already scuttled those plans. The European powers continue to try the failed carrot and stick approach to eliminate any doubts that 's nuclear program is peaceful. They continue despite 's frequent insistence that its nuclear ambitions will not be deterred and even in the face of 's boasting that it "duped" the European powers while playing for time to work on its secret nuclear program. The U.N. Security Council has unanimously approved a resolution imposing sanctions against for refusing to suspend uranium enrichment. The resolution orders all countries to ban the supply of specified materials and technology that could contribute to 's nuclear and missile programs. It also imposes an asset freeze on key companies and people in the country's nuclear and missile programs named on a U.N. list. If refuses to comply, the resolution warns that the council will adopt further nonmilitary sanctions. The resolution was watered down several times over the last couple of months to meet objections from Russia and China. Both China and Russia have strong financial ties with . Russia is building a nuclear power station in the country and China has significant oil interests in . According to the BBC, President Bush and Russian President Putin discussed the issue before the vote, agreeing on the importance of a unified stance. The acting U.S. ambassador to the UN said the resolution "sent a strong warning that there would be serious repercussions to 's continued defiance of the International Atomic Energy Agency (IAEA)." The world continues to dither while continues to make progress in its efforts to become a nuclear power. In October 2003, committed to Britain, France and Germany that it would suspend all uranium enrichment and reprocessing activities. In July 2004, backtracked from its pledge and resumed building nuclear centrifuges, which can be used to enrich uranium for use in bombs. Prior to resuming building centrifuges last summer, said it would do so in retaliation for a resolution from the U.N. nuclear watchdog International Atomic Energy Agency (IAEA), which deplored 's failure to co-operate fully with inspectors from the IAEA. In September 2005, disregarding the ian threats to begin enriching uranium, the IAEA approved a resolution requiring to be reported to the Security Council for failing to convince the agency its nuclear program was entirely peaceful. Unfortunately, the IAEA's resolution did not contain a time frame for the referral. It wasn't until February 2006 that was actually referred to the Security Council. He said that after approval by the ian council, would stop honoring an agreement with the IAEA allowing its inspectors broad powers to monitor and probe Tehran's nuclear activities and would start work on full-scale uranium enrichment — an activity that can produce the fissile core of nuclear warheads. Vaeidi on Friday said referral would mean his country would no longer consider an internationally supported plan to move his country's enrichment to Russia as a way of depriving direct access to the technology. On Saturday, however, he said his country was still considering a response to the Russian plan. It took ten long months for the United Nations to pass today's resolution. And that was in the face of admitting in March that now admits that 's October 2003 agreement with the Europeans was nothing more than a ruse to buy time for the mullahocracy to continue to pursue its secret nuclear program, which had successfully concealed for two decades. And what do we get out of this new Security Council resolution? Based upon the press reports we get nothing more than a piece of paper telling it's been bad. A meaningless condemnation, which specifically assures the tahat the document can't be considered a threat of force if the ian mullahocracy continues in its pursuit of its nuclear program. Hardly a week goes by when some ian official doesn't defiantly state that nothing will prevent from becoming a nuclear power. In order for diplomacy to have a chance of persuading to give up nuclear ambitions, must pay a price for staying the course. Further dithering will only encourage the ian mullahocracy. The Associated Press reports President Bush Accepts Resignation of United Nations Ambassador John Bolton. Bolton will step down when his temporary appointment expires. Bolton's nomination has languished in the Senate Foreign Relations Committee for more than a year, opposed by Democrats and blocked by soon to be former Rhode Island RINO Senator Lincoln Chafee. Tags: ambassador, bolton, bush, u.n.
A leaked U.N. report claims that the Hezbollah terrorist organization and ten African and Middle East countries are arming armed groups inside Somalia in violation of the U.N. arms embargo imposed on Somalia in 1992. Ethiopia, Eritrea, Egypt, Yemen, Libya, , Djibouti, Saudi Arabia, Syria and Uganda have supported armed groups inside Somalia. is said to have sent three consignments this year, including 1,000 machine guns and 45 shoulder-fired surface-to-air missiles. 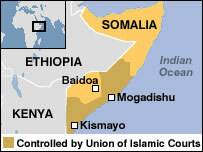 is interested in acquiring rights to uranium deposits in Somalia. More than 700 Somali fighters have gone to support and get training from Hezbollah. According to the Associated Press, the report concludes both the transitional government, backed by Ethiopia, and the Council of Islamic Courts, backed by Eritrea, are preparing for an all-out war for control of Somalia. The authors of the report called on the international community to intercept suspected arms shipments to Somalia. The U.N. Security Council resolution that imposed the embargo does not authorize any methods to enforce it. Both the BBC and the Associated Press note that not everyone who follows Somalia believes everything the report says. It's time for the U.N. to authorize a blockade to enforce the 1992 arms embargo. The U.N. General Assembly continues to vote for a non-permanent member of Security Council from the 32-nation group of Latin American and Caribbean States. Although Guatemala has led Venezuela in but the one tie of the 29 ballots, Guatemala has failed to obtain a two-thirds majority of Member States present and voting. "The honorable thing would be for the candidate that has now lost 28 out of 29 ballots to withdraw," Bolton told reporters at the UN. "But Venezuela insists on putting everyone through this vote after vote. It is clearly obstructionist." "This has to be considered a defeat for Chávez," said Edward Luck, a U.N. expert who heads the Center on International Organization at Columbia University. "The Security Council isn't the place for a mud-wrestling match," Luck said of Chávez's U.N. speech. "People tittered and laughed at his comments." Nile Gardiner, a U.N. expert at the Heritage Foundation, a conservative Washington think tank, argued that Chávez is the bigger loser, given his efforts to raise Venezuela's international profile. Chávez, fueled by his oil-rich nation's petroleum dollars, has campaigned for the open seat for months. "This is a massive victory for common sense on the world stage and a huge defeat for Chávez's virulent brand of fanatic anti-Americanism," Gardiner said. The Guatemala/Venezuela standoff isn't that lengthy by U.N. standards. In 1979, a contest between Colombia and Cuba for a seat on the council went 155 rounds before Mexico was elected as a compromise choice. There is no limit to the number of ballots. Ambassador John Bolton has it right again. Venezuela's refusal to withdraw from the deadlocked race along with Chávez's undiplomatic speech to the General Assembly during which he referred to President Bush as the Devil demonstrates Venezuela's obstructionism and is evidence as to why Venezuela should not be elected to the Security Council while Chávez leads the country. The U.N. Security Council today formally nominated South Korean Foreign Minister Ban Ki-moon to be the next Secretary General of the United Nations. Ban, 62, has been South Korea's foreign minister since January 2004 and has also served as ambassador to the United Nations. Analysts call him a consensus builder who shuns the limelight for quiet diplomacy, rather than an impassioned public speaker. A career diplomat, he came from a poor rural background. Kofi Annan term as Secretary General ends on 31 December. The nomination now goes to the 192-member General Assembly for final approval.